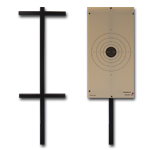 Pierce Targets has the ability to design and manufacture any custom target in any type of frame that fits your shooting needs. We can print your target in black and white, single color or multi-color on a variety of materials. Our frames are designed to be built without the use of any tools which allows you to quickly switch to another target with ease. 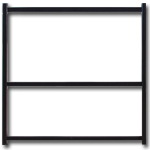 Our 6’x 6’ frame can be assembled by simply piecing the 2 post and three (3) rails together by using the pins. 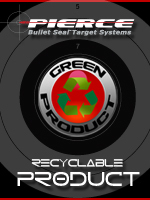 Simply attach your backer to the frame of your choice by using the special Pierce Targets Removable “Christmas Tree” Pins and you are ready to shoot. 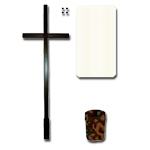 Size: 24" x 48" or 48" x 48"
We have also created a new 2-in-1 plastic, self-healing, adjustable frame. 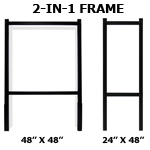 Our 24” x 48” frame can easily be adjusted to a 48” x 48”. It is portable and can be built within in minutes. away. The Cross Frame is portable and can be built within in minutes. It is designed to hold a 24” x 48” Target Backer. The Double Cross Frame is portable and can be built within in minutes. It is designed to hold a 24” x 48” Backer.